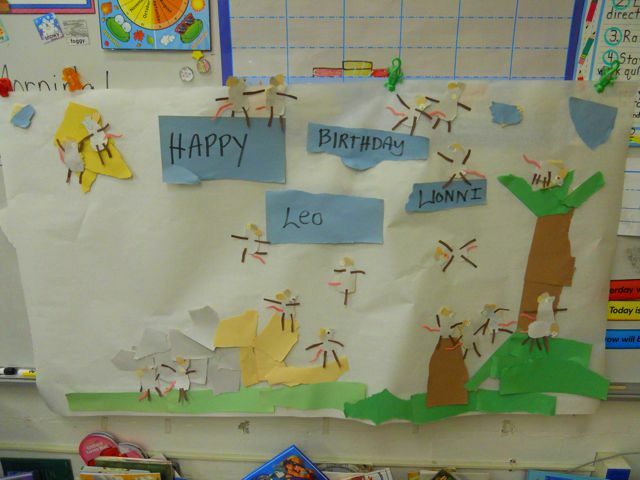 Today I celebrated Leo Lionni's birthday with my daughter's Kindergarten class. I was invited by her teacher to come in this week because the school is holding it's annual Right to Read Week. 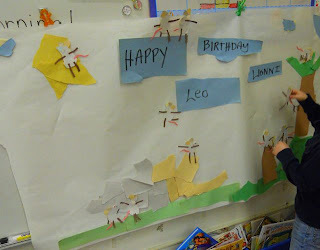 When I looked at my author birthday calendar I knew celebrating Lionni's birthday would be perfect for a group of Kindergarteners. For our celebration we read three books, Little Blue and Little Yellow, Frederick, and Swimmy. Our big activity was creating mice out of colored paper in the style of Lionni that were then added to a large collaborative class mural. The celebration was completed during a 90 minute block time. Here is how the birthday celebration unfolded, from start to finish. I have included very specific details of this lesson, in an effort to make your birthday celebration for Leo a bit easier to organize! The Preparation: Whenever I visit a classroom to celebrate an author's birthday I feel it is important to share at least one interesting story about the author's life or career. My favorite story about Leo Lionni is how his career as a children's author began. He was on a train with his two grandchildren when they started to misbehave. Lionni pulled out a magazine and tore a page into colored shapes and began to tell a story to calm his grandchildren down. 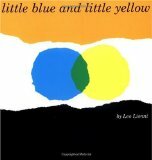 This story became Little Blue and Little Yellow. I knew I would start off my visit by reading this book to the class. I then went to RandomHouse's website dedicated to Leo Lionni and saw a video available on the homepage called "Leo Makes a Mouse." In this video he demonstrates his way of making a "furry" mouse by tearing paper. I knew that this video would be perfect for the kindergarten students because it would give them a chance to see and hear Lionni. Making the materials for this activity was the most time consuming portion of preparing for the birthday celebration. I had to tear enough bodies and cut enough legs, ears, eyes, and tails for each student. It took about an hour and half of tearing and cutting, but it was easily done as I watched a TV after the kids went to bed. 4 legs (different shapes), and a tail! I placed all the materials in baggies and they were ready to go. However, I felt bad that I prepared all the materials -- possibly stifling creativity on the part of the students -- but I felt the preparation was necessary for the success of the lesson. At this point, I wasn't set on which book to read. Lionni wrote many books with mice including my favorites, Frederick, Alexander and the Wind-Up Mouse, and Theodore and the Talking Mushroom. I kept thinking about having the students do more than just make the mice that I had prepared. I wanted them to have a chance to put their "kindergarten" touch on the activity. After some thought, I decided on displaying the mice on a big mural created by tearing pieces of construction paper. I contacted my daughter's teacher, to see what she thought, and to find out if she could acquire a large piece of paper for the background. 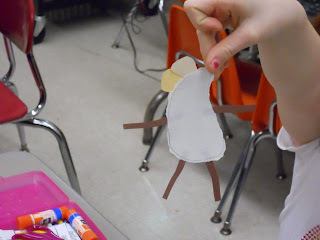 I had plenty of construction paper for the students to create everything their imaginations would allow. It was then that I decided to read Frederick. Reading this book would allow the children to refer back to the reading of this book when it came time to create the mural. Lastly, I wanted the students to be able to take something home that would start a conversation with their parent's about the birthday celebration they had at school for Leo Lionni. When I celebrated Lois Ehlert's birthday with my son's preschool class I had the students make hats to wear home. I wanted to try something different with my daughter's class. I first thought of cupcakes or cookies that would be decorated with a mouse or a fish from one of Lionni's books. After talking about this idea with my wife, we decided that a snack they could take home would be better, and we decided on Goldfish crackers, to match Lionni's book, Swimmy. 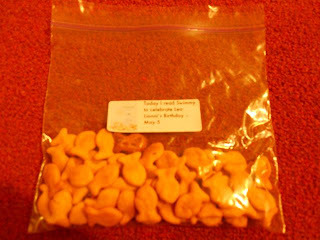 (Yes, that was it, goldfish crackers in a baggie with one cracker being a different color to represent Swimmy!) I went to the grocery store and purchased 4 bags of Pepperidge Farms Goldfish Crackers. Three of the bags were the regular orange crackers and one was a bag of pretzel goldfish. I was able to make 25 baggies with a 1/4 cup of goldfish in each bag. My daughter's job was to scoop in the goldfish and my son dropped in the one pretzel fish, Swimmy. We placed a label on each bag, "Today I read Swimmy to celebrate Leo Lionni's birthday - May 5". fish crackers that would work for Swimmy too! The Lesson: I began with my introduction to Leo Lionni and told the story about how he was on the train with his grandchildren when he created Little Blue and Little Yellow. While I told the story, I tore a piece of blue construction paper into a circle and then did the same for a piece of yellow construction paper. I introduced them to "Little Blue" and "Little Yellow". I told them that they were really good friends. Then, I asked, "What happens when you mix blue and yellow?" (They said, "It turns green!") I tore a piece of green construction paper and asked, "What happened if Little Blue and Little Yellow were to hug." (They replied, "Turn Green!") I placed the piece of green construction paper in front of the hugging pair of circles to show the change. This was the hook I needed to begin the story. I read somewhere that Little Blue and Little Yellow was initially criticized for being too abstract for children, but I learned today that this book has stood the test of time for a reason. The students loved it! When I pulled out my next book, Frederick, I had a student tell me that he was tired. Without hesitating, I switched from reading that book to moving the students back to their desks to watch the Leo Makes a Mouse video which was projected on the wall in the classroom. I am so glad I moved them back to their desks instead of reading two books in a row -- thanks, little guy, for letting me know what needed to happen! After watching the video, I asked the group of students, "What do mice need to do before winter?" (They responded, "Dig holes, Go into a holes, etc.") I probed further to have them talk about the food a mouse would need to gather to survive the winter and they talked about, "Cheese and cheese balls?" I smiled and told them that the mice in this story were looking for berries, nuts, and seeds. (But, when reading the book aloud, I mentioned that the mice gathered cheese and cheese balls just to make sure they were listening!). I warned them that Frederick is not like all the other mice. Then, I read the story about Frederick, a character that Leo Lionni says is most like himself. After reading Frederick, we made our mice. We started by passing out the mice bodies and having the students write their names on the back. 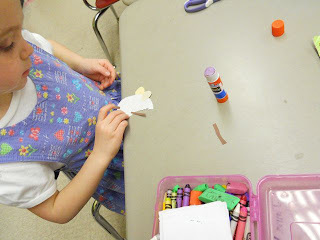 Before I passed out the ears, I told the class it was important for them to make the mouse the way they wanted -- arrange the ears and other body parts without worry of making their mouse look like mine. Then, we passed out the four legs, but I told them that they didn't have to use all the legs. One student asked if they were allowed to trim the legs - "Of, course!" Then we passed out the eyes. The students had to make a pupil with any color marker or crayon of their choice in the center. Lastly, we added the tail. Everyone held up their mouse for a group picture! 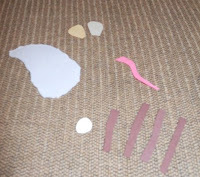 The students only needed a glue stick in addition to the materials that I made. This cute little mouse is almost complete. 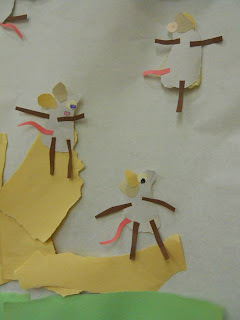 After the mice were complete we hung up our mural paper and asked the children to gather around with their mouse. I told them that we needed to make a place for our mice to live, like a field. I asked the students, "What do we need to add to this blank piece of paper?" The first response was grass. I immediately handed out green construction paper and asked a few students to tear strips to make the grass. In the meantime, I was frantically tearing masking tape to have it rolled and ready to stick the grass to the mural. While they were tearing grass, I asked, "What else is needed?" Someone shouted out, "A sun." I handed out yellow paper to make a sun. It was then that things got rolling. All at the same time, I had students tearing rocks and trees and clouds. I had four teacher hands rolling masking tape and I was slapping torn paper on the mural. Once the scene was complete, we lined up the students to place their mouse on the mural wherever they pleased. The mice became more adventurous as the line dwindled. The mice were everywhere on the rocks, in the tree, on the clouds, and even a few jumped to the sun! 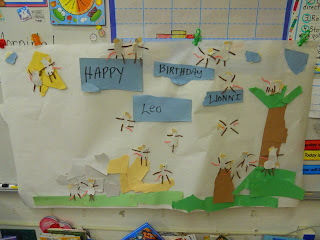 I finished by writing Happy Birthday Leo Lionni in the clouds! A student places his mouse on the mural. Our completed mural! Look at all those happy mice! I love these guys watching their friend jump for joy! I finished the 90 minute session by reading Swimmy and giving my daughter's teacher the prepared snack to be distributed before dismissal. Before I left, I suggested that they dump out the whole bag of fish crackers on the table and then try to make the fish swim together to make one big fish -- and don't forget to make Swimmy the "eye". Today was so much fun. I would like to thank my daughter for all her help in preparation. Also, thank you to her teacher for allowing me to visit. And, thank you to the students for being such good listeners and creative thinkers. Want More Lionni Birthday Fun? Visit Happy Birthday Author's 2010 Leo Lionni Birthday Celebration! That artwork is incredible! I love "Frederick." It's such a testament to the storytellers in all of us.